mechanical and thermal properties of highly dedicated biomass as fuel. fruit (cherries and cherry) and shavings from wood processing. When using these fuels means the automatic control of main operating parameters. For all other forms of biomass burning consult the manufacturer of boilers. that the boilers series TKAN 1.1,1.2 and TKAN 2 in these conditions more efficient than its predecessors, which operate on the principle of free airflow. Efficiency of pellet is over 90%. display. 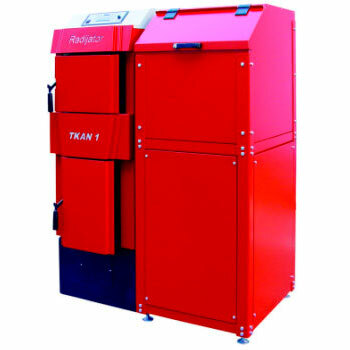 Each biomass boilers series TKAN 1.1,1.2 and TKAN 2 has a copper heat for joining the valve for thermal insurance and valves for kindling. All parts of the water of the boiler are made of seamless pipes and boiler plate thickness of 4 mm or more, depending on the power boiler. of power. TKAN 1.1,1.2 covers a range of forces from 20 to 35 kW and TKAN 2 is in the range 40 to 60 kW.